Cilantro lime rice is one of the main components of the famous Chipotle style Mexican Burrito Bowl.It is an easy recipe which can be prepared with minimal ingredients available in the kitchen.You do not need to make the complete Burrito bowl to enjoy this Cilantro-Lime rice.It pairs up beautifully with any spicy dish and I like to pair it with a spicy bell pepper sauce and Cucumber-Sour cream dip or Rajma. 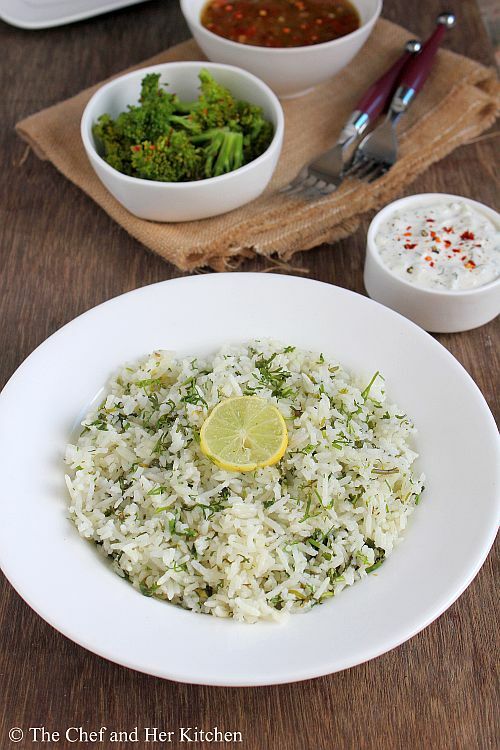 Wash and Soak Basmati rice for 10-15 mins.Drain the water and keep it aside. Heat olive oil/butter in a thick bottomed kadai and add rice and fry well until it becomes translucent. Add 2 cups of water and add salt and few drops of lime juice and cover it and cook it on low flame for 12-15 mins until it is cooked completely.Once the rice is done keep it covered for 10 mins. 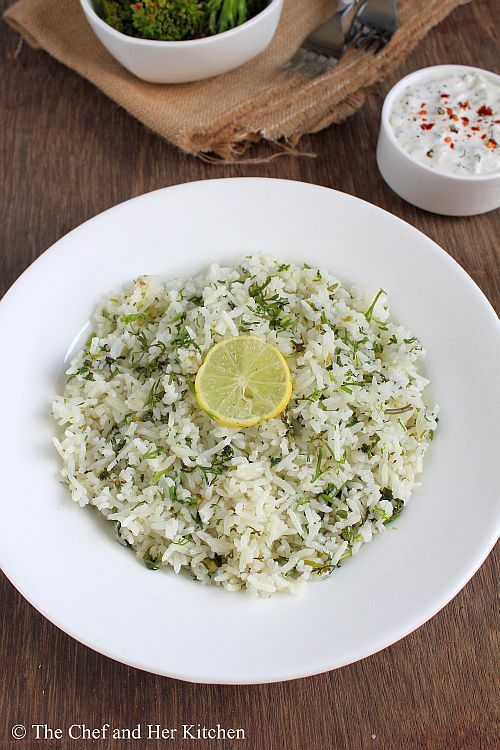 Fluff up the rice with a fork carefully,do not over do this.Add the rest of lime juice,chopped coriander and mix well and keep it aside for 10-15 mins until the flavors blend well. Serve it with any spicy side dish or spicy bell pepper sauce(recipe below) and Cucumber-Sour cream dip like I did.I even served Broccoli stir fry as a side. You can even use it in your burrito bowl.I like to combine this with Indian Kidney beans –Rajma . Sometimes the rice turn bitter if lime juice is added to rice while cooking,hence I prefer to add it after the rice is cooked. 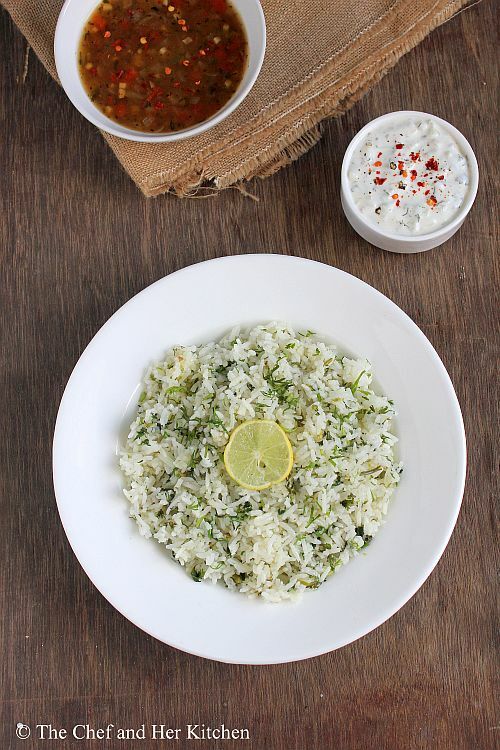 Adding few drops of lime juice while cooking makes the rice fluffy and would not stick. You can saute 2-3 finely chopped garlic pods and 1 finely chopped onion in the oil before adding the rice. If you have vegetable stock in hand,use it instead of water,it makes the rice even more flavorful. You can use any neutral flavored oil instead of olive oil in the recipe. You can use this rice to stuff in a burrito with sour cream,salsa and veggies to make a wrap.